Rolling up his shirt sleeves and tucking his tie in his shirt, Peter Cancro got behind the counter to prove that he can still make a mean submarine sandwich. The head of Jersey Mike’s Subs was showing off his skills at a franchisee’s shop in Whippany. The chain started out as a mom-and-pop sub joint in Point Pleasant in 1956. Today it has 560 outlets in 31 states, with roughly two dozen of them in Ocean and Monmouth counties. Jersey Mike’s — whose shops bake their bread on premises, and slice meat and cheese to order — is part of a wave of new upscale sub chains that are in expansion modes. The company is identifying franchise territories and aims to open 20 to 25 shops in Bergen, Hudson and Morris counties in the next two to three years, said Cancro, who is chief executive officer of Jersey Mike’s Franchise Systems Inc. The Manasquan-based company is looking for sites in towns such as Ridgewood and Franklin Lakes, and may hop over to Manhattan. Burgeoning so-called fast-casual sandwich shops such as Jersey Mike’s are offering higher-quality food — fresh bread and freshly sliced top-grade meat — at a higher price point, courting upscale customers. It’s a fast-growing segment of the $24.1 billion sandwich market, said Darren Tristano, executive vice president at Technomic Inc., a Chicago-based food industry consulting and research firm. These eateries are positioning themselves as an alternative to quick-service sandwich restaurant giants such as Subway. In addition to Jersey Mike’s, the field of fast-casual sub players includes Champaign, Ill.-based Jimmy John’s Gourmet Sandwich Shop, which has an outlet in New Brunswick, and Jacksonville, Fla.-based Firehouse Subs. Jimmy John’s last year generated $895 million in sales, according to Technomic’s estimates. Firehouse Subs posted $284.6 million in revenue, while Jersey Mike’s had $210 million, Technomic estimated. Jimmy John’s and Firehouse subs saw just over 20 percent sales growth from 2010, according to Technomic, while Jersey Mike’s was at 11 percent. Like Jersey Mike’s, Firehouse Subs has started its development process and is scouting sites in the tri-state region, including Bergen County, said Greg Delks, director of franchise development. Founded by two firefighters, the chain has 543 units. Its signature is to steam its meats and cheese before putting them on a toasted roll. “We have a franchisee who has been looking in Paramus, one of our target markets,” Delks said. In the next four to six years, Firehouse Subs plans to have 30 to 50 shops in Bergen, Essex, Union, Rockland and Westchester counties, he said. The first Mike’s Subs, opened by now-deceased Mike Ingravangrallo, built a following with Shore visitors and locals and for its sandwiches, dressed with its trademark blend of red wine vinegar and olive oil. The original shop changed hands several times over the years, and Cancro began working there when he was 14. When he was 17, he heard the store was for sale and his football coach, a banker, got the teen a loan to buy Mike’s. In 1987, Cancro began franchising the sub shop, adding “Jersey” to its moniker, seeing an opportunity to accommodate customers who had moved out of the area and craved the subs in places such as Ohio. Cancro says Jersey’s Mike’s focus on one product, subs, gives it an edge in the competitive market. Tristano said he eats at a Chicago Jersey Mike’s on a regular basis. “They stack up very well,” he said. Fast casual sandwich franchises on average generate more sales volume than Subway, Tristano said. Last year Jimmy John’s volume was $725,000 per unit, with Firehouse Subs at $657,000 and Jersey Mike’s at $435,000, according to Technomic estimates. 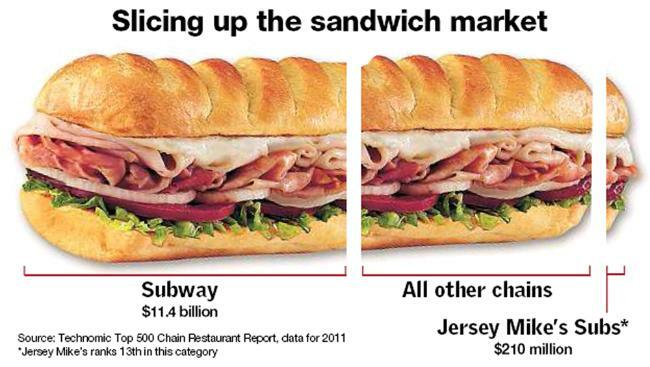 Subway’s average was $469,000. The cost to open a Jersey Mike’s franchise ranges from $216,000 to $400,000, with an initial franchise fee of $18,500, according to Jersey Mike’s website. Franchisees pay a 6.5 percent royalty on gross revenue, Cancro said. This entry was posted on Wednesday, January 23rd, 2013 at 12:05 pm and is filed under Economy, Expansion Strategy, Experience, Financial Activity, Franchise Activity, Future Plans/Announcements, Growth, Sandwich. You can follow any responses to this entry through the RSS 2.0 feed. You can leave a response, or trackback from your own site.